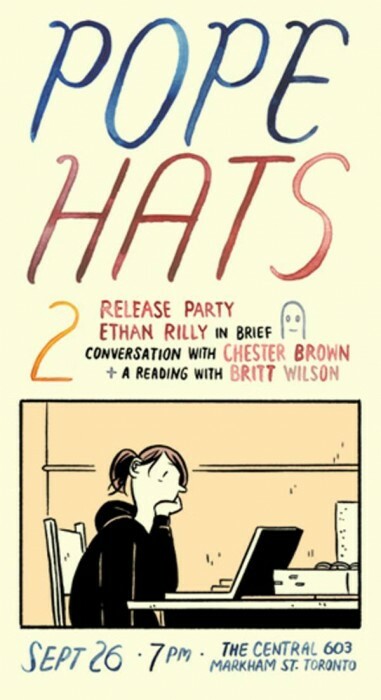 Congratulations to 2010 Gene Day Award Winner ETHAN RILLY on the eve of the publication of POPE HATS #2. Here are the specs on the second issue which will be available in shops in October, and below that some details on an event taking place in Toronto this evening at the Central on Markham Street (near the Beguiling). Hall of Fame Cartoonist Chester Brown will be joining Ethan on stage for a brief conversation about the book, and there will be a special reading of the book with Britt Wilson. Pope Hats #2 by Ethan Rilly. 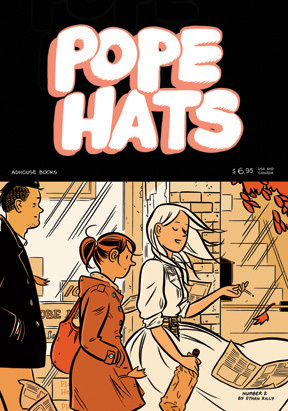 Pope Hats #2 follows the rise of young law clerk Frances Scarland. Frances must survive an unwanted promotion at one of Toronto’s major Bay Street firms, while tending to the regular wake of destruction left behind by her best friend. This eagerly anticipated issue follows what Seth described as “the most impressive debut comic I’ve seen in years” with a surreal exploration of growth and failure in downtown Toronto. Also included is a short story about a long distance relationship. This entry was posted in 2011 Releases, Happenings by Kevin A. Boyd. Bookmark the permalink.